Albert Whitman & Company, 9780807547823, 32pp. Like so many people during the Great Depression of the 1930s, Marshall Loman's dad has lost his job. 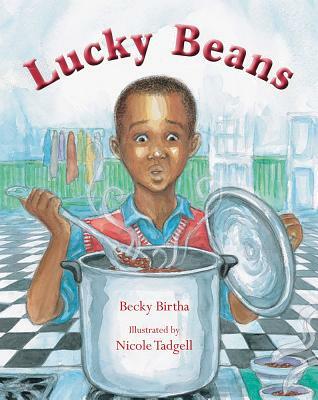 There's little money, but there are plenty of beans-in fact, Ma cooks them for supper every single night! Beans start looking better when Marshall sees the contest posted in the furniture store window. HOW MANY BEANS ARE IN THE JAR? WIN THIS BRAND NEW SEWING MACHINE! Ma needs that sewing machine-but how can Lomans possibly guess right? Then Marshall remembers something he learned in arithmetic class. Becky Birtha's engaging story, based on her grandmother's memories of Depression years in the African American community, is illustrated by Nicole Tadgell's expressive paintings.